Peripheral Neuropathy (PN) is the term used to describe disorders of the peripheral nerves. Even though 10 to 20 million people in the US suffer with PN information is hard to come by. Approximately 50% of diabetics will develop the condition. Many people using statin pills: “cholesterol drugs”, will be affected by this mysterious and under-recognized malady. Neuropathy means �disease or abnormality of the nervous system�, which is not a very helpful definition. We think of neuropathy as any damage to the nervous system. Carpal tunnel syndrome, herniated discs and strokes are all insults to different areas of the nervous system, all with different symptoms. Diabetes is a systemic disease that affects all nerves of the body from the brain, eyes and small nerves of the heart and digestive system, to the nerves in the hands feet and legs. One tool that is commonly used in the medical industry, is Pulsed Infrared Light Therapy or Low Level Light Therapy (LLLT). It’s a newly developed medical device that’s very safe. 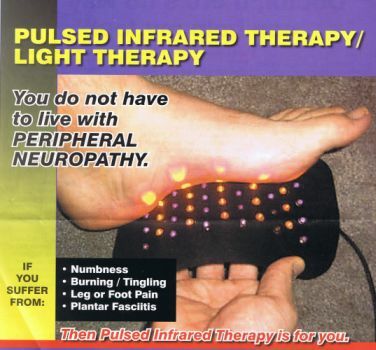 This non-invasive therapy has been clinically proven to work wonders on peripheral neuropathy symptoms. There are two types of symptoms with peripheral neuropathy; negative and positive. Negative signs, which come first, are when damage to the nervous system, obviously, brings about LOSS of a particular function. For example; loss of reflexes, loss of strength, loss of sensation like numbness. But these are rarely detectable to the patient, because the brain makes up the difference in these losses. Only after some time do the sick and damaged nerves develop the positive signs of neuropathy; tingling, burning, biting, stabbing, shooting pains. This too is a reaction of the brain and nervous system, unfortunately this overreaction tears apart the fiber of patients’ lives. Some neuropathies come on suddenly, others over many years. Some people are affected only by a weakness in the arms and legs which leads to difficulty standing, walking, or getting out of a chair. The loss of sensation from the feet, ankles and toes contributes to patients not having a ‘good sense’ of where there feet are in space, touching the ground, and this causes them to fall very easily. These under-recognized sensory losses CAN ONLY be detected with the proper clinical exam. Some patients will eventually become unable to walk at all. Others start with a tingling, pin pricking feeling that turns into deep, sharp, stabbing pains and burning electric shocks. These debilitating problems can also be at their worst at night while trying to get to sleep, because the PAIN never goes away. In fact, once started IT ONLY GETS WORSE!! This Image displays a patient that has used the low level laser treatment. Dr. Adrian Sagman is a chiropractic physician helping symptoms of sports injures and of neuropathies. Miramar Chiro Rehab helps to treat symptoms of neuropathy for many years helping patients recover fast with simple effective physiotherapy and chiro therapies. Dr. Sagman has worked with patients suffering from PN for the last 20 years.